Moussaka is Greek comfort food at its finest. I’m only ¼ Greek, but my family is all in on the food heritage! Moussaka is a winter staple at my parents’ house. It’s layers of sliced potatoes, eggplant, and ground lamb smothered in a tomato sauce and topped with a white sauce and Parmesan cheese. It’s amazing… but it’s definitely not healthy or easy. If I wanted to enjoy this dish on a regular basis, I needed to make some major changes. Our second problem is time and effort. This dish requires some serious work and even more serious clean-up. It’s a solid hour of prep work, an hour in the oven, and half your pots and pans. I rarely have that kind of time and I never want to do that many dishes. So what’s our solution? 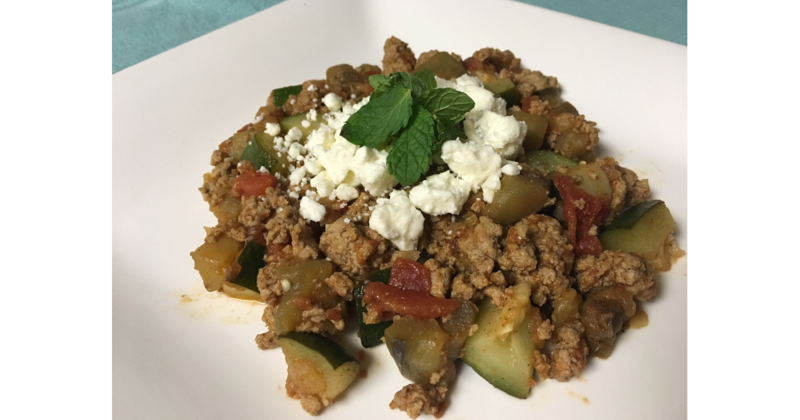 Ground turkey replaces lamb, zucchini replaces eggplant, we ditch the white sauce for feta cheese, and cook the whole thing in a skillet on the stove top. One cutting board, one knife, one pan, 30 minutes! 6) Stir the cinnamon into the can of tomatoes and add it and the turkey. 8) Serve with feta and torn mint leaves. This recipe looks pretty simple, and it is. Something magical happens when you cook tomatoes with cinnamon and onion. It’s definitely an example of the sum being greater than the parts. Then you add the salty feta cheese and the fresh mint and it’s an amazing combination. I frequently substitute the protein in this meal. It would work with ground chicken or beef, but my family happily eats it when I use vegetarian crumbles. It’s a good recipe to try out a meat substitute if you’ve been curious. You’ll notice lots of 2-3 minute sautés. It takes me about 2-3 minutes to chop each vegetable and I’m never organized enough to prep it all beforehand. Fortunately, that works well in this recipe! My kids initially rejected this dinner, even when I served it with a side of pasta. My husband and I both loved it, so I kept it in our dinner rotation and I finally wore them down! They both eat it with minimal complaining and I am claiming it as a victory. Speaking of serving, this recipe easily serves 4 adults. I usually add either whole grain spaghetti or whole wheat bread to my kids’ plates. I occasionally make a salad, but this meal is FULL of vegetables. It’s also packed with protein from the turkey and feta. Skillet Moussaka captures the flavors of the original, with the ease of a weeknight dinner. Extra veggies and ground turkey make it a healthy choice to warm you up as the weather gets chilly. It’s a great meal to add to your weeknight rotation.